For today’s Technique Challenge (TLC410), we were to use a Chalkboard Technique. Apparently I didn’t read or follow all of the instructions. Oh well. I did use white ink on my black “chalkboard”, but I bypassed the embossing and smearing of the “chalk”. The images are from Our Daily Bread designs and the frame image and die cut around the sentiment are sneak peeks of some new stuff being released tomorrow. 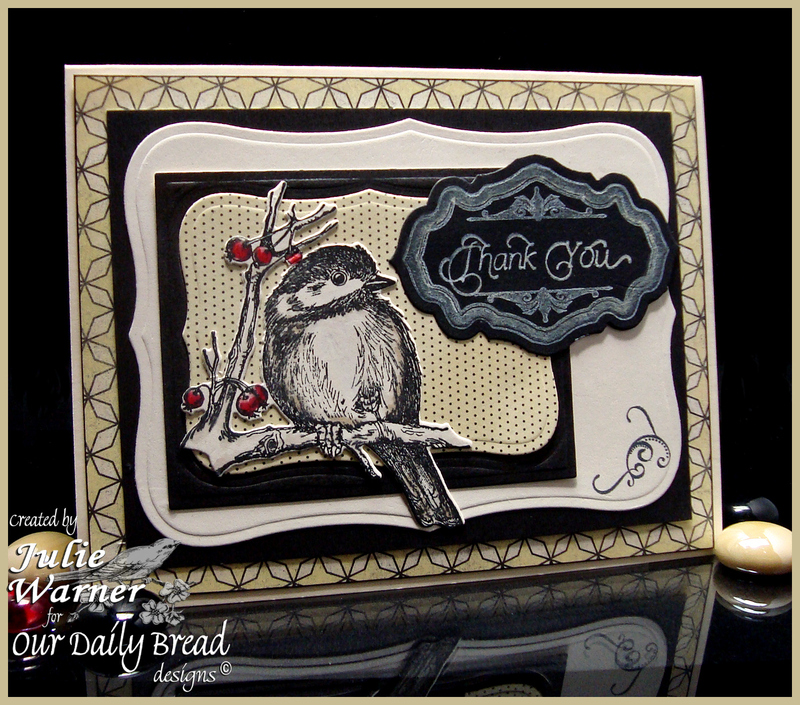 I used the chickadee image and matching die for the little bird and the sentiment and antique label were stamped w/ the chalk ink and die cut. I used a labels 8 and rectangle dies for the panels behind the chickadee. The finished card is 5.50 x 4.25. I sent this to our Avian Vet’s office, who were all so kind & took such good care of Odie, our beloved bird, when he was sick. I was touched that it was still on display in their office months & months later. When New Year comes around, I know I’ll need a birthday card for one of my sisters-in-law. And since she’s the only true winter birthday and lives where they usually have snow, I thought this greeting and all the snowflakes would be perfect. The images are all from DRS Designs. Winter and snowflakes always make me think of shades of icy blue. So I stamped the Lg Filigree Snowflake and 4 in 1 Snowflakes with white pigment ink and white embossed them for the large background. Then I sponged on all the blue inks then stamped a few more of the 4 in 1 snowflakes on top with clear ink and clear embossed them. I like the dimension the different inks and embossing give t the background. 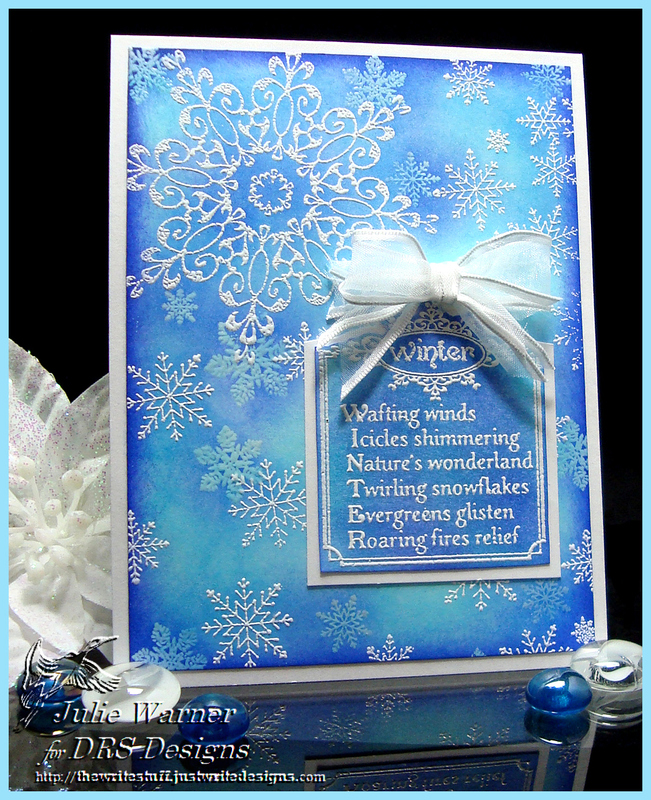 The Winter Wording Square was also white embossed and sponged before cutting out and attaching to a white layer. On the inside I stamped the Snow Doubt Birthday Greeting on the inside. The finished card is 4.25 x 5.50. Thanks so much for stopping by! Have a Great New Year! Congrats to Gail, the Featured Stamper on Splitcoast (FS306)! What a fabulous gallery! I chose her I Made a Wish card. I kept the layout but changed the colors, images and made mine a Christmas card. The images are from Our Daily Bread designs. I stamped the snowflakes in cottage ivy ink on the white bg and a few more on another piece of white and die cut the large one and fussy cut the smaller two. 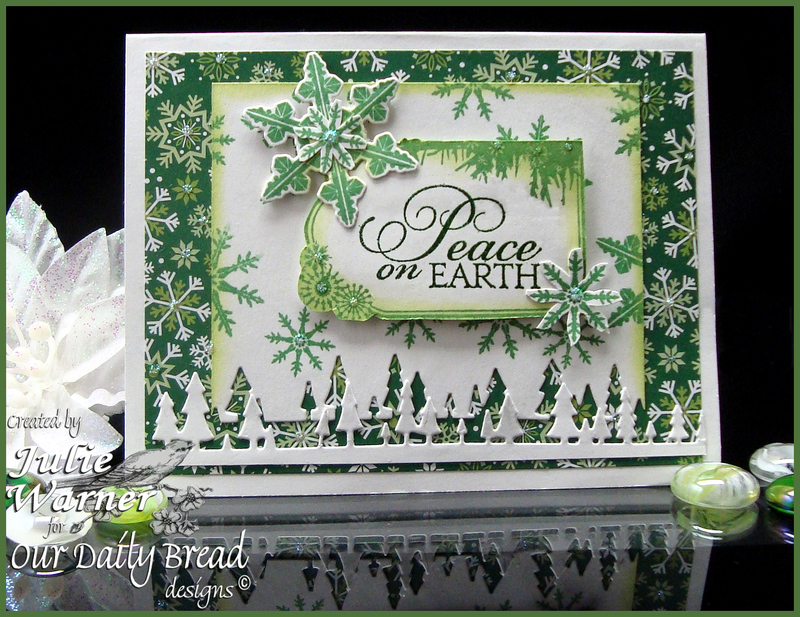 I used a pine tree border along the bottom edge then sponged the edges w/ the new sprout ink. After attaching to a piece of designer paper, I added the cut off part of the pine tree border back on, but slightly shifted. The sentiment was stamped inside the stamped bookmark. I trimmed the bookmark to just the frame part and attached it in the center of my snowflake bg w/ the cut out snowflakes on top. A little stickles was added in the center of the snowflakes and the finished card is 5.50 x 4.25. Thanks so much for stopping by and congrats again, Gail! Enjoy your week!